Here we have reviewed the latest and best travel gear for your next adventure. These are some of our staff’s favorite pieces, depending on where you are going and what you will be doing. Travel bags, totes, backpacks and suitcases. We love traveling and are always looking for practical, lightweight and multi-functional pieces. The Dodger Duffel from Kelty has been my family’s go-to bag. It’s a practical duffel bag to take on road trips, camping, to the beach, on weekend adventures, and on even longer vacations. Before trying this bag, I assumed duffel bags were all the same. They aren’t! What I like most about this Kelty bag is the zippered top. 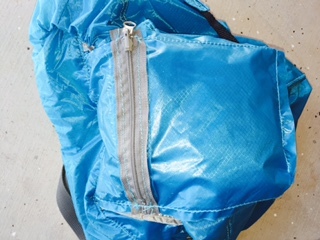 Most duffel bags have a horizontal zipper. The Dodger Duffel has two connecting zippers in sort of a U shape which enables you to lift the top of the bag to see more of what’s inside. This design makes the bag all-around easier to use than traditional duffel bags. My clothes and everything I pack in the duffel stays more organized as I don’t need to unearth everything to find what I need. The entire bag has a light padding. This feature makes the bag stay somewhat upright while you pack it. 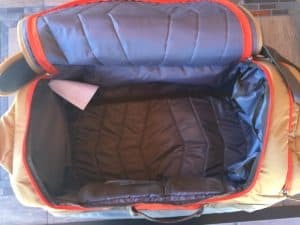 So while typical duffel bags collapse, the Kelty remains somewhat “lifted” even though you can pack it down easily if you want to. We love that there are many easy and convenient ways to carry it. You can carry it from the long adjustable, padded strap. Simply put it over your shoulder like with other duffel bags you may be familiar with. There are also handles on both ends which are easy to use. Another option, which makes this even more practical, is there is a handle on the side in the middle. Because of this, you also have the option to carry it like you would a suitcase. What’s great about all of these handles is you can carry it any which way without having to flip the bag around looking for a strap to carry it. We like this a lot! The bag is lightweight and quite comfortable to carry. It fits easily in the overhead compartment on an airplane. Depending on how much you fill it, it can also fit under the seat. You can fit a lot in this bag. It holds 40 liters. It measures 11.5″ x 21.5″ x 11.5″. Kelty Duffel opens nicely from the top. There is light padding all around the bag. It’s made of sturdy material. Another feature is the hidden pockets. We found three of them. 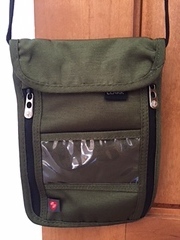 There are two interior pockets which you can easily access but they are hidden inside. One would easily hold a smartphone and the other is a tad larger and could hold your passport, wallet, keys and money, etc. 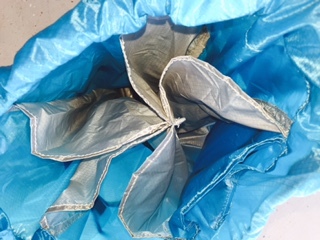 The third pocket we just found after using the Kelty Duffel bag three times. It’s hidden on the side and is ideal for cash. The bonus for us is the side zippered compartment. It’s the perfect spot to separate out clothes you’ve worn or things you want easy access to, like an iPad, book, water bottle, etc. It’s quite roomy, and we were surprised to find we use this part of the bag a lot. The Dodger Duffel comes two- and three-toned attractive colors. There’s a camo pattern with their canyon color (brown) as well as nice gray tones with black, canyon or turquoise. The combinations are neutral yet stunning and unique. It’s an all-around smart-looking bag that has proven to a better grab-and-go option instead of the suitcase we’ve favored over the years. So far we’ve used it three times. My two kids shared it on a three-night trip (to the beach) in which they packed clothing, toiletries, two books, and beach gear. I used it for a six-night trip and was able to put it easily in the overhead compartment on the airplane. The third time, I used it locally to carry brochures and miscellaneous items to help set up an event in my area. Using the Kelty Duffel plus a box, I was able to bring what I needed in just one carry from my car to the event. With the airlines charging so much for baggage, I know we will have my kids share this bag on future trips. It’s easy for them to fit their belongings inside and eliminates the need to carry a much heavier suitcase. This duffel is sturdy and fits a lot. I also like that it’s not a standard solid color and that it doesn’t have the brand name largely splashed across the side like many sports-type duffel bags do. While this hasn’t been a concern for us, some might not like there isn’t a way to remove the shoulder strap. The good news is you can shorten the strap considerably to use this duffel as more of a messenger-type bag. This makes the bag very versatile and practical to use. The Kelty Duffel is our favorite duffel bag. We love the Classic Weekender Bag from Moleskine for work trips. It’s professional-looking and light. It holds a lot. Going on a short trip for 1 – 4 overnights? The weekender bag is a lightweight, versatile tote that will fit your belongings and easily transition with you from your business meetings to the airport. In timeless black, it is neutral in styling and color. Moleskine’s Classic Weekender Bag is one of the newest additions in the Classic Bag Collection and designed to match this line. I carried this bag several times for 2-3 nights away and each time was able to fit everything I wanted to bring. It was the only bag I carried when I was gone 5 days/4 nights when I traveled from Boston to Phoenix for a 2-day conference. I was able to bring several changes of clothes and packed two additional pairs of shoes with accessories with a bit of room to spare, even after packing toiletries and reading materials. I love that the bag extended vertically for when I needed more space, like for my 5-day trip. 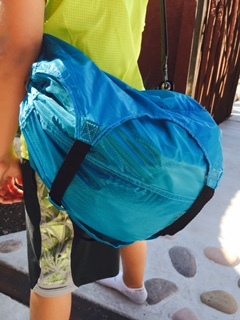 It’s great that you can use this bag for an overnight or two or expand it to pack for a few more days. The bag doesn’t look like a suitcase yet fits easily in the overhead compartment as a carry-on when flying. Before being packed, its cabin size is 15.75″ x 16.5″ x 6.25.” The base itself is 6.25″ but it expands to much wider. Some of the other standouts include the large pocket on the exterior of the bag that opens to a space that can hold stuff you need easy access to. It has a place for a smart phone, IDs and credit cards and pens. I really like that I was able to have that zippered side facing me so that it was protected. What is helpful also is that Moleskin’s large compartment bag opens wide and has a secure spot for your laptop or tablet on one side. On the other side, there are two zippered mesh-type/easy-to-see-through pockets for other important items. The rest is open space to fill as needed. There is a sturdy base at the bottom that surprisingly enables me to place the bag on the ground, and it remains upright. What I love MOST about the Classic Weekender Bag is the versatility I had while carrying it around. The handles are long enough so that I was able to loop the handles over my shoulder. I was also able to carry it lower (like I might carry a bag of groceries to give you an idea). There are straps on the back of it that enabled me to carry it as a backpack as well. Surprisingly, and even better, I could un-clip that “backpack strap” and clip it to the anchors on the side of the bag for a longer strap (to sling it over my shoulder or back). Having so many options for carrying this bag, especially when walking and traveling long distances, is one of the best things about this bag. And because the bag is lightweight, depending on the weight of your items inside, it is easy to tote around. The straps are comfortable. I used it as a backpack when the bag was fully extended and also when it was smaller, and it worked well each time. From a distance, this bag appears to be leather but is actually made from water-resistant polyurethane. I can carry this no matter the weather and not worry about it getting ruined. When traveling, it is so important to not be bogged down with multiple bags, totes, and luggage. Not only does it keep you on high alert trying to keep track of everything, it also physically wears you down by having to carry it all, and it takes a greater toll on the environment. There are many must-haves to bring while camping and hiking. Water is one of the most important things. Sometimes you just can’t physically carry or tote enough water with you. Many portable water filtration systems are impractical. This one is easy to use. Here’s what we love about the Potable Aqua Pure Electrolytic Water Purifier and how it revolutionizes and simplifies the water filtration process. Wow! They really got this right. My husband loves hiking and camping. Now that we have children, our hikes are shorter, but living in the southwest US, it is hot many months of the year. We can only carry so much water, especially for those all-day day hikes we want to do but are restricted by the amount of water we can carry. What would we do if there was an emergency? 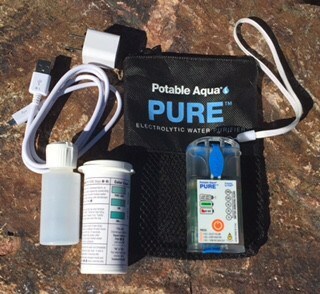 No matter where we hike now — a long or short hike, for minutes, hours, all day, or overnight — we bring this Potable Aqua Pure Electrolytic Water Purifier with us. It is so small that it easily fits in our day pack. Weighing 4 ounces, it fits easily in your palm. It is affordable. It is revolutionary. And it can really help you or even save you when you really need it. This little water purifier exceeds the Environmental Protection Agency’s (EPA) Guide Standard and Protocol for Testing Microbiological Purifiers. It is very easy to use and only requires a small amount of water and salt (self-made brine solution) that the device will then purify for you into a mixed oxidant disinfectant that you add to your water to purify your water. It’s scalable, so you can treat from one – 20 liters of water per disinfected brine cycle, but you can purify larger amounts of water by simply using multiple disinfected brine solution cycles. It kills bacteria, viruses, Protozao, Cryptosporidium, and Giardia so that you can safely drink the water. This disinfection process will help protect water that you store for later use. No batteries to replace – USB charging or built-in solar charger. It wull treat 150+ liters when fully charged. Weighs 4 ounces; this is lighter than most. Cost effective – Buy the device and you only need regular table salt. It simply requires salt to operate, nothing else to buy or replace. Also, it comes with pH strips so you can use to confirm the disinfected brine solution before you add it to the water you are purifying. My husband has used other water purification systems before. They all had tubes, were cumbersome and not compact, and required pumping; this one does not. My husband would rather carry 15-20 pounds of water, than a traditional water filter. This is a great product for those traveling to other parts of the world where clean drinking water isn’t a given. It is also ideal for those who enjoy hiking and/or camping for extended periods of time as you can only bring in and carry a limited amount of safe water. This is also great to include with your survival packs and disaster preparedness kits. It barely takes up any space and comes with a small tote to keep everything together. It even has a built-in flashlight. The Potable Aqua Pure Electrolytic Water Purifier can purify and treat up to 60,000 liters of water without having to clean, change or buy a new filter or other replacement parts. We think it is just remarkable. Travel smarter with the best travel gear for your particular journey or adventure whether you are going for a day hike, a road trip for the weekend, or camping for a week or more. You know how important it is be smart about what you pack when you travel. Many of you have seen our previous recommendations, including Ultimate Video Camera For Travelers, Travel Pillows and Portable Travel Digital Luggage Scale. What to bring and what to leave at home? We’ve been testing some new travel products and have put together a list of some of our favorites. 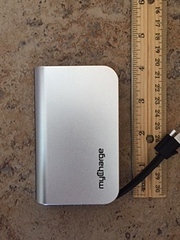 We really love this portable charger by myCharge. It offers up to 45 hours of power for your iPhone and iPad. 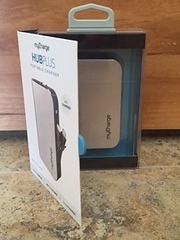 We’ve seen a few different portable chargers on the market and what makes the HubPlus Portable Charger unique is that it has its own self-contained wall prong to charge the battery. It even has a built-in micro-USB cable so you don’t need your own. That’s great because so many cords become misplaced when they are used for several devices. I absolutely love that this unit has everything included to do what I need it to do, when I need it. Unfortunately, so does my husband, who collects and owns many portable chargers. It seems that this is also becoming his favorite as well, it mysteriously disappears from my bag on occasion and finds it way in to his. Even more: It can charge two devices at the same time, and it’s a rapid charger too. It is gender-neutral in style, color and design, and it easily fits in a backpack, briefcase or tote. Also, it’s nicely packaged – perfect for a gift – and it’s sleek in anodized aluminum. 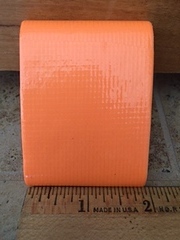 Approximate measurements: 4″ x 2.25″ x .8″. I brought this to a convention where I wasn’t going to have access to my charger until the evening. After using it twice, I was happy I brought it. I’m looking forward to bringing it and showing it off at my kids’ all-day sports’ tournaments and math competitions where we sit around all day. I’m sure I’ll be helping several grateful parents who have smart phones that run out of battery! This is a fantastic portable charger! We do love portable chargers. I couldn’t decide which of the Chic Buds products to choose, as there were so many colors and style choices. I didn’t realize these portable chargers were now becoming fashion accessories too. Who knew phone chargers could be so fun? The Chic Buds Clutchette Power is a carry-all for your smart phone, credit cards, and keys. I love it. It comes in 16 colors; I chose it in plum. I like that it’s a wristlet so that I can use it as an easy way to carry my phone when I don’t want to tote around a purse. Since receiving it, I’ve used it every time I pick up my kids from school. I usually have to walk at least a block away, and I always bring my phone and car keys with me. Now I’ve been putting both of them inside this clutch. I never owned a clutch before, so this has been a great way for me to protect my smart phone from dropping. While I wanted it for the technical features, I am surprised by how much I am enjoying using it for everyday living. The Chic Buds Clutchette Power zippers all along the top and down one side. Mine opens to reveal a fun black polka dot lining on a white background. Inside is a zippered pocket which holds the battery. It is easy to charge. 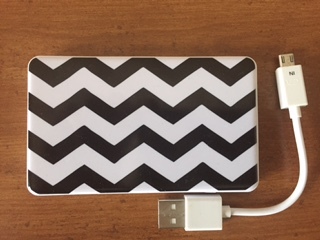 There is a USB cable included to plug into your computer or wall adapter. You keep the battery inside and just plug in the cable right from this mini-purse. After the battery is charged, you can use it wherever you are and can charge your smart phone. You do need to use/bring the charging cable that would have come with your smart phone. It’s unbelievably convenient as so many times I’m running out the door with a low charge to my phone. I often forget to plug it into my car adapter, or I’m just going on a short jaunt so it’s not worth it. Now I can charge for however long I need right from this clutch. I imagine it would charge tablets too – I haven’t done that as I don’t tote my iPad around. I also wanted to try the Chic Buds Slim Power Phone Charger. This one is portable also. It is a stand-alone battery, not in a clutch or any type of purse. I love the chevron pattern. It comes in 14 colors/patterns so you can pick one that will be easy to spot in your purse, backpack, etc. I keep mine in my purse to always have an extra charge when I need it. It is basically the same idea as the clutch in that it enables you to charge your smart phone wherever you are, as long as you have pre-charged the battery. It comes with the power cable to charge into the wall adapter or computer. You just need the charging cable for your particular device. 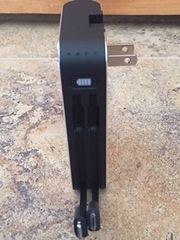 What I didn’t realize about this Slim Power Phone Charger before I ordered it is that it has a way for you to see how much charge the battery has. There is a button on the side of it that you press and there are three small lights that will indicate if you have a 0 – 33% charge remaining; 34 – 67% remaining; or 68% – 100% remaining. This is a very practical feature. With most portable chargers, you don’t know how much power you have used and how much remains. I also love that this is small — the size of a credit card — and about a quarter of an inch thick. 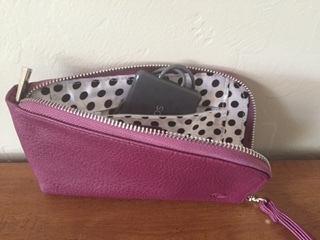 This has been easy to just keep in one of my go-to purses and charge up my phone as well as my husband’s and kid’s devices as well. We don’t generally rely on it as a power source, but it is sure convenient to have and can be so helpful in an emergency situation if I was ever low on battery. When the Slim Power battery is fully charged, it provides up to 10 hours of talk time. I will definitely be bringing it when I go hiking. While I haven’t taken either the Clutch or the Slim Power on a vacation yet, I will bring both of them from now on. According to the Ocean Conservancy, the average American uses 300 plastic bags per year , and a single plastic bag can take 1,000 years to disintegrate. Wow… here’s a company who is doing something to make a difference. I love my blu bags. They are reusable, strong, stylish and fun. During my years living in Bellingham, WA, they instituted a ban on plastic bags. Stores would not give them out, and if you didn’t bring your own, you could buy a paper bag for 10 cents or buy a reusable cloth or nylon bag in some stores. I became really good at remembering my bags, and felt good about doing it. The only downside was that the ones I had were all mismatched in color and in type (some cloth, some nylon, all different sizes) and after washing them weekly, they looked even worse. 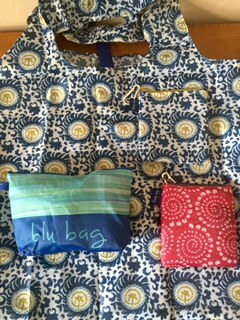 I love that these blu bags come in chic patterns and all go well together. Blu bags from rockflowerpaper come in colorful patterns which make using them fun. They are sold individually or in sets of three. They measure 24” by 19” when opened. I love that they each can hold up to 50 pounds and come with a little pouch to put them away easily. There is a small elastic loop so that you can fold and secure them. I like that I can hold them in my hands, looped on my arms, or even on my shoulder like a purse. What’s also great? Rockflowerpaper donates from each blu bag sold to Ocean Conservancy. We’ve heard of and used money belts before, and we love them, but this takes the “hands free” concept to a new level. The Flipbelt is great for when you exercise or travel. It is form-fitting, comfortable and not bulky. It is made from a single piece of fabric – no zippers, etc. – and is able to hold your smart phone, keys, money, ID, or other small items you want to bring with you but don’t want to carry. The micropoly/Lycra fabric stretches to put on, and then once on your waist, it stretches so you can easily insert or access your items from multiple access points. We like that you have somewhere to put your essential items so you can be hands-free and worry-free. There are lots of colors to choose from. Maybe you want a bright color if you will use it more for exercise activities and a more neutral black color if you will use it primarily for travel security. Available in sizes XS to XL, their sizing chart is helpful for you to get the perfect fit. We love that it’s easy to machine wash and dry. It’s a great travel accessory and ideal for hiking, cycling and walking. We look forward to using it on our next trip for more of a security measure, like we would use a money belt. We LOVE that the FlipBelt is made in USA. 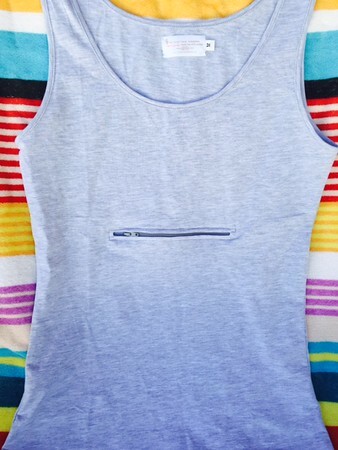 We thought this was one of the more clever gift ideas we’ve seen so we ordered the women’s tank top in gray. It was a true-to-size, flattering fit, made with 100% cotton. What’s different and unique about this shirt is that it has a sizable zippered pocket right on the front which can hold a smart phone, passport, and/or money. We tested the shirt out while cycling, walking, and hiking while toting our phone and keys in the pocket. We didn’t have occasion to test it out for actual travel or in a crowded venue but can see how safe and convenient it would be to guard one’s belongings. This would be great for safely carrying your passport around while abroad. Locally, it would work for amusements parks (think, upside down roller coasters!) crowded concerts and fests, and for times when you want to be hands-free. They also offer men’s and women’s tee shirts (in neutral colors) as well as underwear and long johns, all with zippers to hold your essential items. This shirt is machine washable. You should air dry it. We love the Moleskine line of travel bags and totes. The Moleskine Classic Tote Bag, is as stylish and purposeful as their other products. This smart bag comes in neutral black with an ivory interior. We like it because it is large enough for digital products up to 13” with lots of room to spare without being bulky. The top of the bag zippers completely so I felt good about carrying it while on public transportation and walking the busy downtown areas in Boston. Commuting to and from work with this bag has been great with the water resistant, polyurethane exterior. Living in a diverse climate with rain and snow, I don’t have to worry about ruining one of the leather bags I previously used. I am actually excited to carry this tote in the rain! The handles are long enough to carry comfortably as well as loop on a chair, and I was pleasantly surprised when I realized it even stands upright on its own. 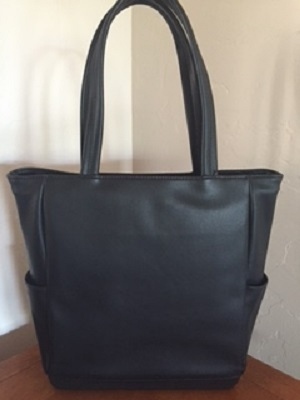 I used the Moleskine Classic Tote Bag to carry my belongings to and from work and meetings. And when I went out to a restaurant directly from work, I was able to use this as my purse. It held my tablet, wallet, my makeup bag, a sweater, and a few other random things. I could easily use this for an overnight as well, as it measures just over 14” in height and is just over 16” in width. There are three easy-to-access interior side pockets, one with a zipper, and then there is the main compartment. There are two exterior pockets on each side as well but I haven’t used them yet. They would fit a water bottle, keys, or a smart phone if you needed easy access. You can secure the entire bag with the top zipper. 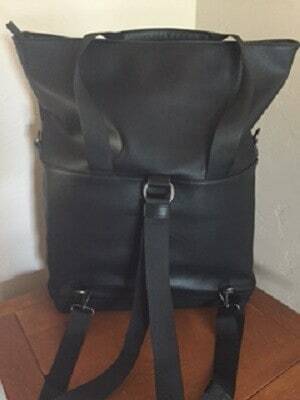 What do I love best about this bag? It can be casual or business-like. It is versatile enough for me to use most everywhere I go. I don’t have to “change purses” when I’m running from a work meeting to social occasion to an event at my boys’ school. It holds everything I need and matches everything. The Moleskine Classic Tote Bag features a timeless style, is functional and is overall just a classic piece. What makes this a great gift when everyone probably has charging cables already? 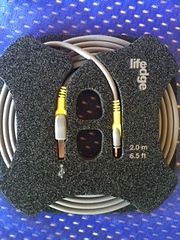 The Ultimate Charge/Sync Cable from Lifedge are 100% waterproof and are guaranteed for life. With past cords/charging cables, I’ve had to discard and recycle them because I twisted them as I tried to connect them to either my phone, the port or the outlet. These from Lifedge are thicker and tougher. The connectors won’t fray because they offer extra-strength strain relief. And again, should something unexpected happen, they can be returned for a replacement with the company’s lifetime guarantee. 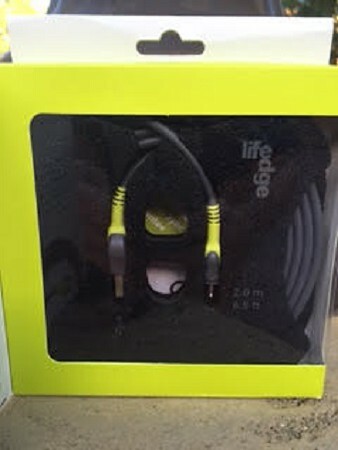 I also like that the Lifedge cables charge my devices faster than the chargers that came with my smart phone and iPad and the other chargers I own. You can purchase them for an iPad, iPhone, and iPod. They are also tangle-free. The cables are extra long, measuring 6.5 feet. They also come with a cable organizer which is fast and easy to use and keeps it together nicely in a backpack or drawer. Just grab and go with this five-piece travel set from The Jojoba Company. Their Travel Essentials Pack already comes in a sleek travel pouch for easy packing. The products are perfectly sized and ready to pass TSA screening. These enriched skin care formulas will keep your skin hydrated and rejuvenated even after a long flight. The Travel Essentials Pack includes: hydrating day cream; jojoba bead facial cleanser; lemon & coconut hand cream; intense overnight renewal cream (includes marine collagen and CoQ10 to encourage overnight skin renewal); and 100% natural Australian jojoba. These are awesome for travel and trekking when you are sure to be expecting the unexpected. So far, I only used them for home, car, and work use, not traveling but they are completely sealed, enabling them to be 100% waterproof. Update: My son’s fingers were peeling oddly, and we put this lotion on him at night. By the morning, it was healed/cured. If I can find this product anywhere again online, I will buy it again. A little goes a long way with these products as they feature 100% Australian jojoba. Jojoba is a naturally hydrating antioxidant rich in vitamins A, D, and E.
Here is an easy way to change up your look and have a little fun while traveling. 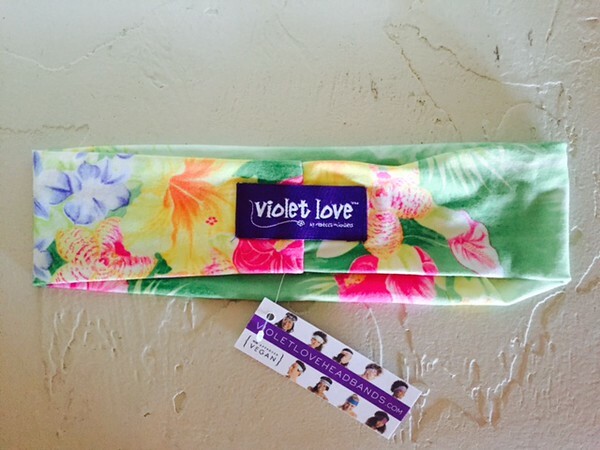 Violet Love Headbands take up hardly any space so they are a perfect way to add some flair and to change your look when you are trying to pack light. These premium headbands come in unique, specialty patterns in bright colors. They can be worn lots of different ways, and they receive rave reviews for their slip-free fitting. We love the company’s many green practices. Their printing process takes advantage of the opportunity to be environmentally conscious from reusing the printing cylinders to recycling the inks. The best part? They use only environmentally friendly inks, free from allergens and from hazardous chemicals. We strive to pack light and need the items we pack to serve multiple purposes and to be versatile. We are always on the lookout for new travel products and gift ideas and are interested in how companies continue to innovate with practical travel items to help travelers pack light and be safer. We are always looking for the latest in travel products. We heard of this company, Lewis N Clark, and found they have a wide variety of travel items that we liked. We had our staff review their website for items they wanted to try, sounded interesting, and would be something they would use on a trip. Below are Lewis N Clark product reviews from our staff of seasoned travelers. How did we choose the Lewis N Clark products? Our team enjoys camping, hiking, taking cruises, road trips, RV-ing, flying, tours, river rafting, and all out adventuring anywhere. We love travel products that serve dual purposes, are light, compact, easy-to-carry, and are practical. We like to travel light wherever we go, so we are prudent about what we recommend. This is what I’ve been waiting for! 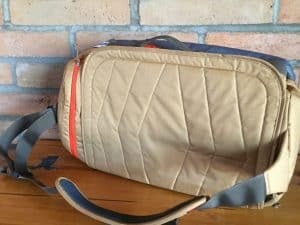 I have wanted a lightweight, WATERPROOF bag to take on our river rafting trips. It is awesome for other outdoor adventures as well, even in the dry season. I’ve used this Roll-Top Duffel bag several times, mostly for camping. My fourth grader took it for his three-night Cub Scout camping trip. The only piece of “luggage” he owned was his school backpack, and I realized that he probably shouldn’t bring one of my suitcases on his camping trip. This Duffle Bag from Lewis N Clark fit all his belongings well. The only downside is that there isn’t a separate compartment to keep smaller things organized and easy to find, especially things like money and a flashlight. It POURED for one entire day, and while this bag was in his tent, it stayed completely dry, even with the winds and rain coming inside. This rugged waterproof bag measures approximately 24” wide and 21.5” in height when fully extended. It folds down to about 12” in height. The easy roll-top closure ensures the contents stay dry. There is a removable shoulder strap. It’s made from durable 600D mesh PVC that is dual-coated. I will continue to take this for my outside overnight adventures (my husband has already tried to take it for his own use), and even on day trips on my friend’s boat. It’s lightweight (their website says it weighs just 38 ounces) and folds easily for storage. 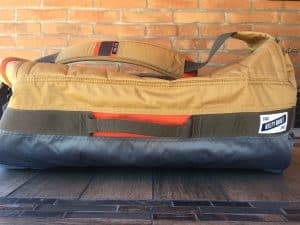 This duffel comes with a 1 yr warranty, but I love that their other duffel bags come with a lifetime guarantee. I have wanted one of these travel neck pillows for years. Even though they aren’t terribly expensive, I never bought one. I’ve considered them many times, and I’ve walked past them at stores in airports. Once on my flight, I always regretted not buying them. I soon realized that I have been missing out. Not only could have I been using this on the many flights I’ve taken, I could have been using this while as a passenger for long car rides. My kids always want a turn using it as well. This Comfort Neck Pillow is comfortable and props my head in a good position so that I can sleep while upright. While there are many brands available, I like the pillow from from Lewis N Clark because it offers ergonomic support for my head and neck. It has loop if you want to hang it when not using it. There’s also a Velcro strap so that you can attach it to your bag or luggage when in transit. The only downside is that it doesn’t have a removable cover. I really wish it did. However, the fleece (offered in four different colors) is hand washable. Best of all and surprisingly, it actually enables me to get some sleep while in transit… something I haven’t been able to do in years. 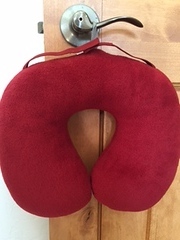 Update: My teenager brought this neck pillow on an overnight bus ride on a trip for school. Teachers told the students to bring a pillow. He brought a pillow for the first trip but for the second one, months later, he wanted to bring the neck pillow. He was happy he did. It was a lot easier to deal with. He said he was able to easily position it how he wanted to. It is bad enough we have to worry about actually having our wallet stolen, and now we have to worry about electronic pick-pocking too? High on our list when traveling is feeling safe and secure; we want that in our daily outings too, whether traveling or not. 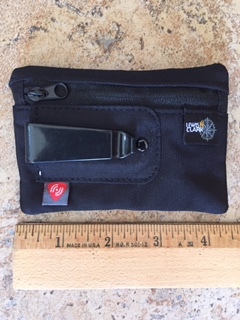 This little case is meant to block the RFID (radio frequency identification) signals that enable thieves to steal your credit card information. It is large enough to hold a driver’s license and several credit, debit and insurance cards. There is room to spare for money, but that would be the most it could carry as it is just 3.5” x 4.5”. It clips to clothing and comes in black or a tan-ish gray. I love products that help me protect and keep track of my valuables and essentials, like my IDs, credit cards and money. I have tried money belts and clothes with hidden zippers and like them. When I saw this Neck Stash advertised, I wanted to try it for my trip to Mexico. Another great Lewis N Clark product, I like that this Neck Stash is lightweight, weighing only 5.5 ounces. I wore this often, sandwiching it between by tee shirt and sweater. It was hidden yet easily accessible when I needed it. I love that it wasn’t as visible as a purse or backpack. My husband wasn’t worried about his wallet getting pick-pocketed because everything he and I needed fit in the RFID Luxe Neck Stash. There are two zippered pockets and two pockets that open. There is a clear area (without a closure) to put an ID in though I didn’t use this feature. The strap adjusts which is great because it is comfortable for whatever your height. The Neck Stash was larger than I expected it to be, almost 8 inches in height and 5.5 inches in width. At first I thought it would be too big but it worked out that it fit everything we needed. I even put my smart phone in it for most of the time. What makes this neck protective case different from many is that it blocks up to 13.56 Mhz frequencies making it difficult for someone to scan your credit cards or passport. Here is something that is so handy but you never really think about buying it until you need it. This Flat Cloth Tape is something to tuck inside your backpack or first aid kit. It will be waiting for you when you need it to repair a leaking canteen or a rip in your tent. I first used it when my daughter went to overnight camp, and I needed to label her belongings, including her clothing. I used a Sharpie on the tape as well as a regular pen and was happy with both. I’ve since used this Flat Cloth Tape from Lewis N Clark several times for various things. It comes in different colors – including camo — which is fun and also helpful if you are trying to label different people’s belongings. We asked our staff to pick a few items they would be interested in trying and that they would want to use while traveling. These Lewis N Clark product reviews include some products that are more unique than others. Some are items we always wanted to own, just never bought them. Others are travel products we might already have but Lewis N Clark has found a way to improve upon them. We always love reviewing the latest in travel products. As you know, we travel a lot. If we are not away trekking or experiencing new cities on long trips we are spending weekends away or visiting friends and family. We are always on the lookout for new and exciting products to see what works best for the kinds of activities we enjoy. We received the Gobi Gear HOBOROLL and were excited to try it on our trip to Tucson, Arizona. In the past, if we were going on a plane, coach or train and not planning to hike from place to place, we would take a suitcase. If we went hiking or camping, a backpack would be the answer. Today, regardless of where we are going, we normally opt for a travel roll. It is the new generation of luggage, that is slowly but surely replacing the rest. Our current favorite is the Gobi Gear HOBOROLL. The HOBOROLL is made from lightweight and seemingly durable nylon-type material. It measures 10″ in diameter and 15″ in length. These packs expand as you need them to and can be opened and secured from both ends. There are five separate compartments which separate your items. Also, there is a hidden zippered pocket which can hold your wallet, phone, etc. As of now, the HOBOROLL comes in three colors: Mineral Blue, Midnight Lava, and Pinyon Pine. There is a separate adjustable strap that is sold separately. This is a unique piece in that — unlike other roll luggage — you do not lie it flat. You sort of stuff the compartments then secure the drawstring end closures. This compression sack is really a multi-purpose bag. It works well for going to the beach or pool and even would make a fantastic diaper bag. It seems like it would be easy to attach it to a backpack as well. Empty, it seems small, so I was surprised by everything I was able to fit in it. It folds up to a tiny square and weighs only 3.5 ounces. Therefore, it is not going to take up much wardrobe space should you pack it to use once on your trip. The Gobi Gear HOBOROLL will easily fit your belongings. The first day I used it, I was able to fit my water bottle, a pair of flip flops, sunscreen, bug repellent, a first aid kit, a hat, and a tee shirt. There was room to spare. I liked that I was able to keep like items together like the sunscreen, repellent and the first aid kit. During my trip, I used the Gobi Gear HOBOROLL mainly for easy day hikes but found it useful even for short walks with my family. I put three water bottles — one in each compartment — along with a sweatshirt in the HOBOROLL when walking at night with my kids. My kids were happy to not have to carry their water bottles for once! It was nice the water bottles weren’t clanging against each other. They fit well with room to spare. There is a versatile and adjustable shoulder strap available. This is an extra but a useful one. It easily clips to the bag. The padded shoulder piece was very helpful when I carried heavier items, like the water bottles, in the HoboRoll. I like that you can chose whether or not to buy this item separately. For my purposes and habits, it was essential, so I’m glad I have it. I also liked that I could open the sack from either side. While I didn’t have it stuffed with clothing like I would for a trip or bigger excursion, if I did, it would be very handy to be able to open the sack from one end or the other without having to empty the contents of the bag for something I had packed at the bottom. The clips are made from anodized aluminum which we learned makes them very strong but lightweight… no plastic here! The Gobi Gear HOBOROLL is exceptionally well made. 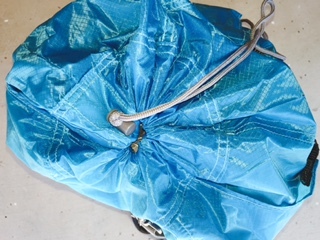 It is a stylish and functional stuff sack. We like pretty much everything about this innovative bag. The only thing was that it would be nice if there was a way of turning this into a pack that you can carry like a backpack. This would make it more versatile, and then you really wouldn’t need the strap. There is definitely a knack to packing the Gobi Gear HOBOROLL if you want to get the most out of it. Start by stuffing the secret pocket with sensitive items like your keys, wallet, and other important items you may need access to. Depending on where we were and what we were doing, we most often would tend not to put our phone or passport in there. We normally carry those items on us somewhere we can quickly find them and regularly check that they are still there. Now you just need to fill each compartment. Shoes will take up an entire compartment or even two, depending on the size and type of shoe. It is best to fill the compartments with socks, underwear or small toiletry items to maximize the space you have available. Slot them into a compartment and fill in any gaps with more socks or other small items. Tee shirts, shorts, swimsuit, fast-drying travel towels, and lightweight pants will fit well too. We enjoy using our Gobi Gear HOBOROLL and look forward to using it on a longer trip. In the meantime, I will continue to enjoy it, especially as I continue my trip through in Arizona in the summer, where I am always either carrying or using my water bottle, sunglasses, hat, and sunscreen. You will be happy with how much you can fit into the innovative Gobi Gear HOBOROLL. Last week we received a great travel question asking: What items are a ‘must’ for packing into a backpack, & what really doesn’t need to come with you? Well, I can start out by saying that the first time I left for a big trip I thought I needed to bring my whole house with me to be able to survive. Among a lot of other stuff, I brought not only one but two pairs of high heels (romantic!). Obviously, you don’t need that. Among other things only a few weeks into our trip, and I carried on with my backpack a little lighter than before. However, the longer we traveled the more we realized how little we actually needed. Something you really don’t need to bring that I know many people do is 7-days worth of underwear. Unless you will be out of water for a week (which you won’t be), you only need to bring 2 or 3 at the most. Everyday you wash one in the shower and let it dry over night or day, wear one pair and have a spare one in case. You can also buy light-weight tramping quick-dry underwear, and also underwear you don’t need to wash for a few weeks… not personal experience, but saw them in the shop! – more than one pair of walking shoes, a massive makeup bag, hair dyer, hair straighter, etc… more than 1 pair of jeans (if any; wear them so you don’t have to pack them), a 15 inch+ laptop (instead get a cheap 10-11 inch one – for size, weight and cheap in-case it breaks), a camera tripod, more than one real book at a time – use ebooks instead, because books add so much extra weight to your pack. Also a common thing you will see around the world is when you stay at hostels you will see a bunch of second-hand books sitting around. They normally let you trade your book for one of those which are left. So at every place you stay, you can just pick up a *new* book, and leave your old one for someone else to enjoy. This is something that before I left, I had no idea I would need so badly, or use so much – a good pair of walking shoes! The only reason I bought them was because they were on 70% off in a camping store. I fell in love with my Teva Dozer Sandals, who walked me through everything, and never let me down. Without a good pair of walking shoes there are so many things I wouldn’t have done. I wasn’t used to do much walking, so I never knew how important it was to have a good pair of shoes. If I would have had to worry about having sore feet or blisters I would never have walked where I did, so I’m glad I had my Tevas. If anyone has read the book “Yoga For People Who Can’t Be Bothered To Do It” by Geoff Dyer you know that I’m not the only one who is obsessed and praise their Teva’s like a god. Nathan loved them too, but so did some crazy big animal with sharp teeth. One morning we woke up and discovered that Nathan’s shoes were gone. We found them later totally ripped apart and full of teeth marks right through the sandal. No matter where you are or where you’re heading, all shoes you bring have to be comfortable, because you never know how long you’ll have to walk in them. Even the flip flops should be nice to walk in, I strongly recommend the Havaianas Sandals. They’re made of a special material that is really good for your feet and doesn’t rub down the inside of the heel like many others. I like the ones with a strap going across your ankle, you’ll never risk dropping them! Now let’s ask our readers – what are some of your travel items which are a MUST BRING and what are some things which you would never take again on your travels? Packing Essentials – Thelma and Louise is one of my all-time favorite road trip movies, and every time I watch a clip from the movie I want to take to the road on a new adventure. There is something about the freedom of being able to turn off on a new unknown road or stop over for a break whenever you feel like it that makes road trips so appealing – all the opportunities for spur of the moment trips. But if you’re going for a long trip that will last at least a couple of days, you will need a little more planning. You would be surprised to find just how grateful you will be that you brought that rag along in the last moment, or that you remembered to bring the wet wipes and a toilet paper roll. The only thing you can be sure will happen is that at some point of your road trip you will spill something, you will need to wash your hands and you will need to find a toilet – and the last one will not be the most hygienic..! Be sure to have contact numbers for your insurance agency for auto and homeowners, in case something happens and you need to reach them. Also have other numbers handy such as a family member, police and emergency numbers. Don’t rely on your phone but jot the numbers down in a notebook – if you need insurance, look at WorldNomads, and if you’re road tripping with a caravan take a look at the Caravan Club website as items in your caravan may not be covered by regular insurance. I always marvel at how classy the women in old 50’s movies look when they step out of their convertible cars in high heels and wrinkle free skirts. It’s yet a mystery how they manage to pull that off, and I don’t suggest anyone taking on the challenge. Instead, dress comfortably, and wear shoes that are easy to slip on and off. If you are lucky to have a convertible, however, there is one thing you could learn from the classy 50’s women: the head scarf. Without it your hair will be a mess and surprisingly greasy already after a few hours. Trust me I made that mistake once myself. Bringing snacks on a road trip is as obvious as bringing car keys for the trip to actually work. But there is a risk that you will run out of snacks before you even hit the highway. To avoid this, repack all your snacks into smaller bags so that you can store some away for later during the day. The best part about road trips is that as lunch time approaches, you can stop over by a lake or other resting area along the way and have a picnic. Don’t bother bringing real plates and cutlery, but stick with paper plates and plastic cups and cutlery instead. Do bring a proper knife and cutting board though, and a bottle opener. Whether it’s an app on your iphone/blackberry, or an actual GPS device in your car, knowing exactly where you are and which roads you should be on is one of the best ways to make sure that you stay on track. Even if you do decide to take a different road than the one your GPS has chosen for you, it will be easy to get back on the right track later on. However, DO NOT use Apple’s own map, we’ve all heard of how dangerously wrong it can be (read: Apple Map Fails). We use an app called “Pocket Earth” which has been incredibly useful! Bring along a normal map of the areas you will be driving through as a backup, since you can never trust technology to 100%. The number one essential is of course to have some good road trip songs, preferably tracks you can sing along with. One of my favorite ways of finding good road trip music is via ipod, where others put together and share their playlists. 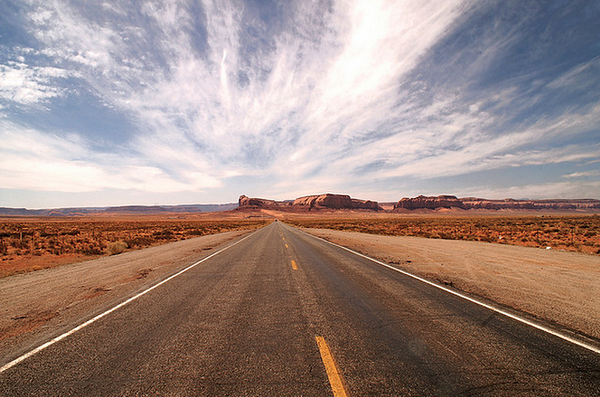 Simply search for “road trip” playlists and you will find some great music for the road! After enough sing-along road trip songs you will want to entertain yourself with something different, and for that there is no better and more travel-friendly thing than apps. But aside from games, also download some other useful apps like the weather so you know what to prepare for down the road. To prevent running out of battery with your phone, laptop and everything else you bring along, invest in an electricity power inverter. These devices turn the charge from your car’s battery into electricity to power most small electronic devices like laptops and phones. Just plug it into your cigarette lighter and it converts in the direct current (DC) from the battery to the alternating current (AC). An alternative is to bring a portable charger that you have charged up before hand, and recharge it again when you stop for the night at a caravan camping station. Finally, unless you haven’t already thought of it, make sure you have an emergency toolkit in your car with an orange flag and flares in case you need help, a spare tire and a flashlight. 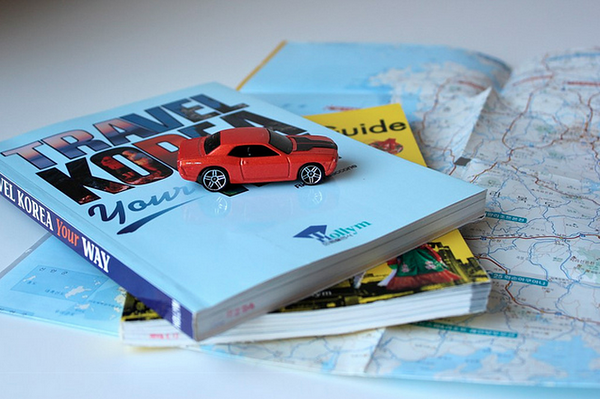 Take some time to do some road trip planning to have the trip of your life. Your bag is your entire life when you travel. Everything familiar and essential for your trip has been packed into what you can carry (or afford to have the airline carry). One of the simplest ways you can protect your belongings is with luggage locks. While luggage locks aren’t a fail safe, they are invaluable to the vigilant traveler. Today, we’re breaking down a few reasons why you can’t afford to travel without these handy accessories. Ready to learn more? Let’s go! Before we begin our discussion on the advantages of traveling with luggage locks, it’s important to note that while you’re in the airport and flying to your destination, you’ll be required to comply with local authorities on their usage. In the United States, the Transportation Security Administration (TSA) has broad power to examine your luggage to ensure maximum security. “TSA is careful to not damage any personal belongings, however, we are not liable for damage caused to locked bags that must be opened for security purposes,” reads a TSA blog post addressing baggage locks. Many luggage locks have TSA-compliant key holes to allow TSA agents to open the lock without destroying it. To save your wallet and your luggage, it pays to have a lock the TSA can get into without breaking your lock or your bag. Luggage locks have also been known to snag on conveyor belts. Combined with TSA search inquiries, these issues have caused most major airlines to adopt policies discouraging travelers from locking their bags when they go through the airports. Delta Airlines and American Airlines are pretty explicit about not having luggage locks on your bags. At the very least, some airlines require a TSA-approved lock. The good news is there are new types of locks that are both sleek enough to avoid getting caught in conveyors and look impressive, which is half the battle. Even with limitations on locks in airports, luggage locks are a must-buy for travelers. First, remember that it only feels like you are in the airport forever. Most of your time (hopefully) will be spent admiring the wonders of Europe. Second, remember that most petty criminals are cowards. This is what makes a good lock a good buy. The reason why your baggage lock is so powerful is simple: mind games. Criminals often operate opportunistically and are looking for an easy score. Simply the appearance of difficulty is enough to deter most would-be criminals. The guise of security is important because it sends a clear message that criminalizing your property would be difficult. It’s a lot harder to bypass a lock on a bag than to simply unzip it when someone is not paying attention. Further, a good lock is going to take a fair bit of time or effort to cause to fail. This is obvious and it gives you, bystanders or the authorities to act appropriately. Which Luggage Locks Are for Me? There are a lot of luggage locks out there. While a bit overwhelming, this does give you the ability to chose the lock that is perfect for you. Basic shopping rules apply. Only buy from known and trusted vendors. Here are a few other things to consider. These are possibly the most simple, but effective, types of locks. The combo lock limits the number of openings that can be compromised by crooks. Without a keyhole, the only other opening would be the TSA-approved access port. There is a range of number combo options. Most combo locks are three numbers. Some go up to five, significantly increasing the number combinations that would need to be tried to open your lock by chance. Some locks are now able to use the 26-character Latin alphabet rather than the 10-character numeral system. This also increases the number of possible combos for added security. Just remember to really mix up the keys. There is no point to having the lock if anyone can simply open the lock because you didn’t reset the combo keys. These locks are often the most robust. With only one true moving piece (the key hole and tumblers) there isn’t a lot to try to compromise. Their simplicity allows for really solid design, with some opting for brass and steel. This craftsmanship also prevents criminals who simply try to cause the lock to fail from brute force. Cable locks use a flexible steel cable rather than a solid piece of metal to close the lock. This allows you added convenience and creativity. If you are able to loop the cable through the zipper heads and a handle, you give another anchor and, thus, strength for your lock. Sometimes these locks have two cables. They also come with either key or combo locks. Some more high-tech locks are able to communicate with your cell phone or a company server (thanks, internet of things!). If you know that your bag has been open and when it was opened, you can rest assured knowing that you have a starting point for officials if your bag’s contents are violated by a criminal. 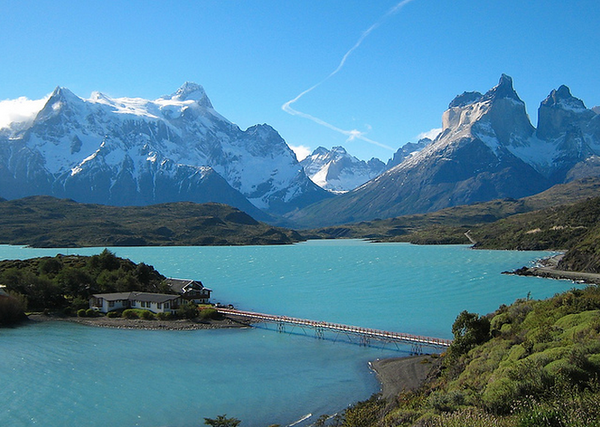 Traveling is an incredible experience and one that shouldn’t be wrought with fear. You can add a great deal of security and peace of mind to your trip by simply adding luggage locks and luggage tags to your travel repertoire. Now that you know the power of these little tools, you can go confidently in the direction of your wildest dreams — a fabulous vacation to Europe, Africa, Asia, Australia … anywhere! Christmas is getting closer and people are preparing for doing some Christmas shopping – hoping not to get as stressed out and in-the-last-minute as the year before. To save yourself much of the hassle of running in and out of crowded shops in the city having to deal with long lines and irritated people, you can get so many presents in the comfort of your own home via the internet. If you’re still not sure what to buy, consider the gift of travel. In this materialized world, giving an experience is very appreciated – and it doesn’t have to cost a lot of money. Why not give two nights accommodation at a nice hotel for two? If they haven’t booked a trip anywhere, you can give them a gift card to a hotel chain which can be found all over the world, so that they can use it whenever they will be traveling. Marriott, Four Seasons Hotel and Best Western are two international famous hotel chains which offer travel gift cards. If you want to make the options even broader, you can buy gift vouchers and instant e-vouchers from specialized hotel gift websites, offering choices all over the world on city hotels, spa and country hotels. If they like taking cruises you can give them a cruise gift card to use when they buy their cruise tickets. If you know they have already planned a trip with a specific cruise, you can buy them gift card on the actual cruise trip like a massage treatment, a dinner. If you know they have a already planed a trip and bought the tickets and bought their accommodation, give them a fun experience that they wouldn’t have thought of themselves. A city pass is an excellent idea, which gives them free entrance to a long list of attractions in the city they visit, and most large cities have one. If you know they like playing golf, give them golf vouchers to a great golf resort nearby. There are many great golf gift ideas out there, from shoes to gear to clothes, but a golf trip is definitely something more fun for golf lovers who like traveling. Buying an actual plane ticket can be a great idea and a huge success, but it can also go terribly wrong. Save yourself the awkwardness of giving a flight to a place the person doesn’t want to go or at a time when they can’t, and make things more flexible. Buy a gift card at an airline instead, most of the major airlines provide gift cards where you can put everything from ten to a thousand dollars on the card, and then you can let them choose the destination instead. The bad thing about giving gift vouchers and cards is that the receiver knows exactly how much you spent on the gift. If you feel a bit uncomfortable about that, another option would be to give away your spare airline miles. Airline miles can be transferred to someone else, and it’s harder to say exactly how much 10,000 airline miles are worth. If you don’t have any airline miles, try to find vouchers and gift cards that are more specific and don’t offer any of their services for X amount of money. For instance, the voucher will say that you have a free 60 minute back massage at the spa on the cruise or hotel. No matter where you travel and how you plan to get there, you will have a better experience with the right travel gear. What’s the best travel gear for you depends on what you have already and what you want to upgrade. With so many bags, devices and items available, be sure to pick the ones you will imagine yourself using often — for more than travel. In this way, you will have less to store and know you are investing in quality items to serve you for years.